This is how I see the relationship between the piece The system was blinking red and the piece Our aim has not been to assign individual blame. One could not exist without the other and together they tell a more complete story. Inside the book, The 9/11 Commission Report, there is a chapter titled Heroism and Horror. This chapter describes the 102 minutes of the morning on September 11th, in grizzly detail. Through this chapter we re-live the planes crashing and the towers falling. Blanketing the city in massive, forceful clouds of smoke and dust. It is in this section that a new figure has been cut into this ground, which depicts the towers standing tall then falling to dust. 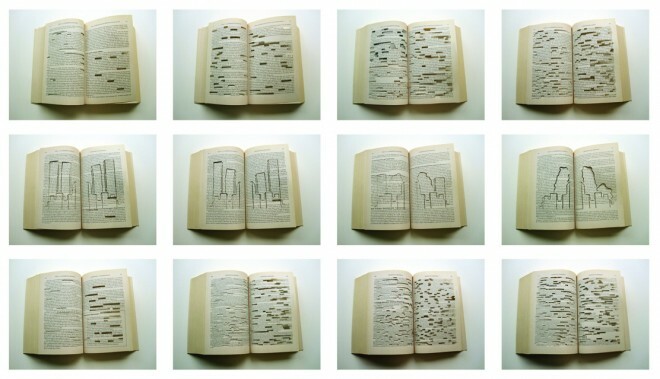 Through a short time lapse video the book reveals the voids from page to page. And towards the middle the voids decrease in intensity and the twin towers appear and then quickly disappear. Providing further context to the cut pages and voids containing all the missing names that quickly flip by.